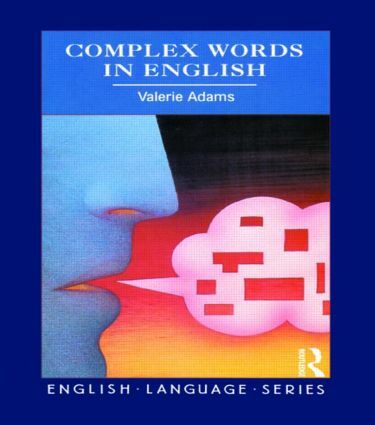 Complex Words in English presents a comprehensive account of present-day word formation in English. Starting with a discussion of some basic issues, including the definition of 'word', motivation, lexicalization, productivity, the relevance of historical information and the usefulness of dictionaries and other data-bases, the book then moves on to describe in detail a variety of prefixing, suffixing and compounding patterns - all illustrated with copious up-to-date examples. Other topics that are explored in-depth include diminutives, backformation and other effects of reanalysis, Latin and Greek based formations and sound symbolism. Many examples are given in context: recent writing and the records of OED on CD ROM are drawn on to demonstrate the relationship between spontaneous coinages and familiar items. The comprehensive coverage allows an instructive overview and comparison of patterns and of the many and diverse factors relevant to the notion of productivity. Throughout, the discussions are placed in the context of other recent and less recent work in the area and the book also contains a useful extensive bibliography.